Musings on bicycling, travel and life. What we are riding and why. 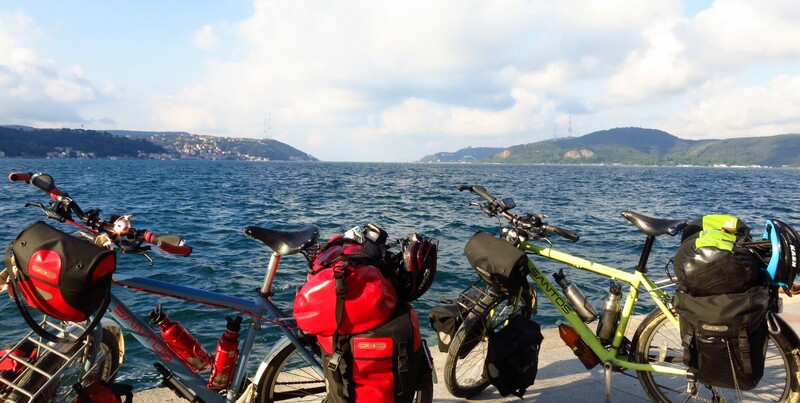 Santos Travelmaster 2.6 Alu : After an exhaustive research and trial and error process we decided that this was the bike that we would be spending the next year living on. The first thing that drew me to this bike was the geometry. It is shaped much more like a mountain bike than most touring bikes on the market. This was appealing due to the mixed surfaces that we expect to be encountering between Morocco and Singapore. The Travelmaster is offered in steel and aluminum and with 26in or 700cm wheels. We decided on the aluminum with 26in wheels. Aluminum was chosen for its stiffness. With all the mountains that I will be crawling up, I don’t want to lose any of my effort to frame flexing. 26in wheels were chosen for their strength and availability worldwide. This is the build. Parts were mostly chosen for their ruggedness and ability to be serviced almost anywhere. Sugino Crankset I’m almost positive this is the right one. Sun Rhynolite Rims 26 inch 36 spoke with Shimano XT hubs. This is hopefully the mythical bombproof wheelset. Double wall box section, eyeletted, extra wide rim. Perfect for hauling heavy loads long distances. Greenfield Rear Mounted Kickstand This is a new addition to our bikes and I can’t believe how helpful this little doodad is. Amy’s Brooks Saddle A woman’s saddle is best for a woman, this is voice from personal experience. Amy has Butterfly touring handle bars and Brian has Riser Bars with Bar Ends and both have Grgon GP1 grips it’s great for my comfort level. Hand Made Accessory Bars. Each of us made one out of old bike parts we had just lying around. Bike-Packer Classic Rear Panniers, Front-Roller Classic Panniers, Ultimate Classic 5 Handlebar Bag, Rack Pack ,Dry Bag for Brian’s Rack Pack All Ortlieb, another bicycle touring standard.